My eyes did not deceive-this was truly a wonder to behold. I plopped down my cash, and ran ecstatically back to my chosen venue, and proceeded to open and imbibe what can only be described as pure, pear-ile bliss. 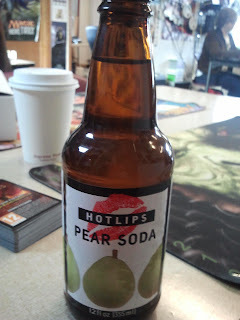 It was everything a pear soda should be, and rightfully so-they use actual pears in the making of the soda! Listed on their website is which farms they purchase all of their fruit from. How's that for awesomeness? You usually only know where your ingredients come from if you make your own, so kudos to Hotlips Soda for providing us with that information. Pretty awesome of them if you ask me. 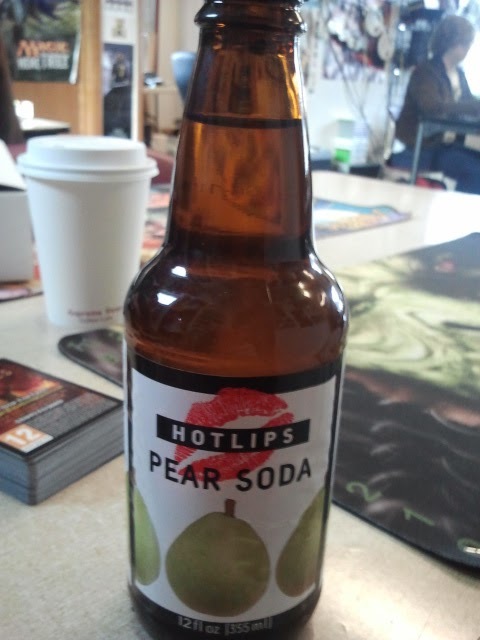 I like the pears on the label-especially considering the fact that they use REAL fruit to flavor their soda-some bottles reportedly contain fruit pulp. Smells exactly like liquid pear, but not overwhelmingly so-which makes it much more realistic. It does suffer from the drawback of having to be pasteurized-something which makes all juice-sodas taste a little too tart/wine like in my opinion, but I can't hold it too much against them that they need shelf life. A great tasting soda, just sweet enough and very refreshing. It was a great compliment to my greek salad pita. An amazing beverage. Highly recommended. I can't wait to try the rest of their line.